In a dry kadai add the til (sesame) seeds and fry till it starts crackling. Remove the fried til seeds and keep it aside. In the same kadai add fenugreek seeds and fry till it turns light brown. Allow to the fried seed to cool. Crush the fried til seeds and fenugreek into powder form. Soak tamarind in a cup of water and take out the tamarind juice. Chop the brinjal into tiny pieces. In a thick bottomed kadai, put the oil. When it is hot add mustard. When it starts pop up, add Asafoetida powder and curry leaves. Then add chopped brinjal pieces and fry for few minutes. Close with a lid and allow to cook on low flame. No need to add water, but if necessary just sprinkle a handful of water and cook it till soft. Once it is cooked soft, add red chilli powder, coriander powder, turmeric powder and salt. Mix it well. Then add tamarind extract and stir well. Allow to cook till it become thick. Finally add the til and fenugreek powder and once again mix it well and remove. It can be eaten mixed with hot rice or serve with chapati/bread. Note:We can also grind the brinjals to a paste and use it in the above recipe. In that case, first fry the brinjal pieces in a teaspoon of oil. Cool it and then grind it to a coarse paste. Or you can grill the whole brinjal, remove the skin and grind it to a coarse paste. If you want to keep it for a week or so, then little more oil and make this thokku. Is this thokku stay long or should I use it on the same day? My family just finished enjoying this dish. Thank you for this. I definitely will be trying out all your other recipes. Thank you Vidya for your kind feedback. I tried stuffed brinjal curry. it was so yummy. thanks. now i have become a frequent visitor to your site. Thanks for this receipe. Turned out yum. Basically, rasavangi, pitali and sambar are same. But for rasavangi Whole gram (Kondai kadali) is added and for pitlai bengal gram is added. This is very tasty- similar to ennai kathirikai. It is so simple to do without onions and tomatoes. Will definitely go into my little note book. Thank u so much!! Can you please tell me different recipes to make with “kovakai”? Some variety of brinjal tastes bitter. May be that is the reason. Try with good quality big size brinjal. Thank you for your feed back. The brinjal curry served with biriyani differs slightly. You can try the stuffed brinjal which will also go well with Biriyani. I just made this thokku for a Diwali dinner last night. My guests LOVED it, and it was gone in minutes. It is easy to make and truly delicious. I am an Indian settled in UK. I tried the brinjal thokku with the big brinjal, 5 to 10 times the small Indian ones. This has come out nice, taking it for our Christmas Party. Easy to make with very clear instructions, especially, for a husband, cooks very occasionally! Thank you Dr for your kind feed back. I just discovered this site and it is awesome. 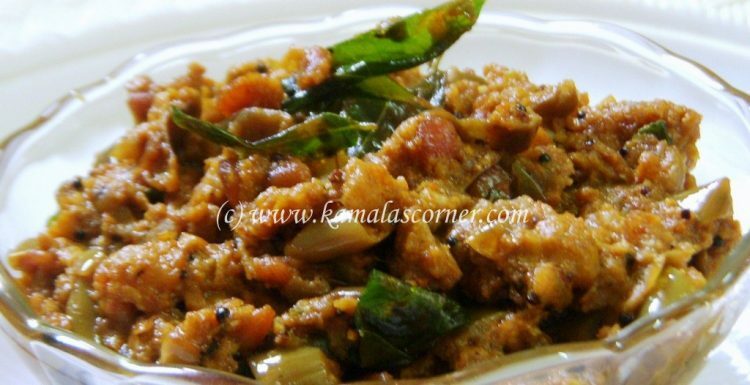 I made this recipe and it came out very well.definitely an easy kathirikkai with lots of flavor. Welcome to our site Sudha. Thank you for your kind feed back.